* New topic: Does Ginkgo biloba affect memory? * New photo photospecial page: Old Ginkgo tree in Zuidhorn, the Netherlands. * Fossils-page: update recent research on ovule evolution (incl. Spanish version). 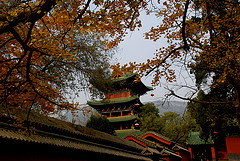 Great photo of Ginkgo trees at the Shaolin Temple near Dengfeng, Henan, China. * History-page / Tree-page / Fossils-page: update recent research on 'wild' Ginkgos in China (incl. Spanish version). * Propagation-page: update recent research on dispersal agents of Ginkgo seeds. Spanish version. Police in Canton, Connecticut, are seeking a hand-carved wooden sign stolen two weeks ago from the former George Fillmore Goldsmiths and Jewellers store on busy Route 44. The sign — one of two gold-colored ginkgo leaf signs that had been on the building since the 1980s — is valued at $ 5,000. The sign, secured 5 feet up on the side of the store by three metal bolts, was taken sometime between 5 p.m. Jan. 24 and 8 a.m. Jan. 25. The thief cut the bolts to get the sign, owner Weber said. The Weber family chose the ginkgo leaf design because ginkgoes are one of the world's most ancient trees, and the leaf symbolized gold smiting, one of the world's oldest trades. * Added topic: How could dinosaurs reach over 110 tonnes by eating ferns and Ginkgo? This illustration shows a newfound "mini pterodactyl," which lived in the canopies of ancient ginkgo forests in what is now China about 120 million years ago. The sparrow-size Nemicolopterus crypticus, whose discovery was announced this week by Chinese and Brazilian scientists, is one of the smallest pterosaurs known. This fossil “opens a new chapter on the evolutionary history of this group of [flying] reptiles,” said study lead author Alexander Kellner, of the Universidade Federal do Rio de Janeiro in Brazil. * Added YouTube video: Bette Midler about Ginkgo. * Added many photos of Ginkgo trees sent to me by readers in Germany. Thank you ! 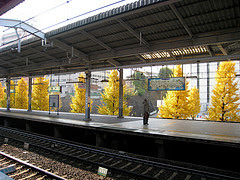 Beautiful photo of many Ginkgo trees near Shinagawa station in Tokyo, Japan (by Picture). More photos here. Ecological and Evolutionary Implications. Also added list of references 1988-2000 Univ.of Queensland. * Added Ginkgo digitata fossil, Cretaceous, Spitsbergen, Norway.